The 2015 Fly Formula Facet helmet utilizes Carbon Fiber, Kevlar, Titanium, and COOLMAX® technology. The Formula combines top shelf materials with advanced composite technology and sets the standard for high-end protection, comfort, and style. One ride and you'll feel the difference. Fly Racing is an elite motocross company that produces top of the line race wear and apparel for professional rides and customers alike. The Fly Racing – 2015 Formula Facet Helmet are made from a carbon fiber, Kevlar, Titanium and COOLMAX technology to give you maximum protection, comfort and support. The Fly Racing – 2015 Formula Facet Helmet outer shell is constructed from aircraft grade carbon fiber and Kevlar materials that maximize their durability and creates maximum strength to keep your head fully protected. These dirt bike helmets are extremely lightweight and feel like a pillow around your head. Made to be extremely comfortable, lightweight, and durable, these Fly Racing – 2015 Formula Facet Helmet are top of line helmets that also offer maximum airflow. The Fly Racing dirt bike helmets are designed to have a multi-port induction cooling system with 11 intake vents and 4 exhaust vents to keep your head cool on those long rides or track days. Fly Racing thought of everything to make this helmet as light as it could be so they equipped this Fly Racing – 2015 Formula Facet Helmet with Titanium screws, rivets and D-rings for superior strength and durability. 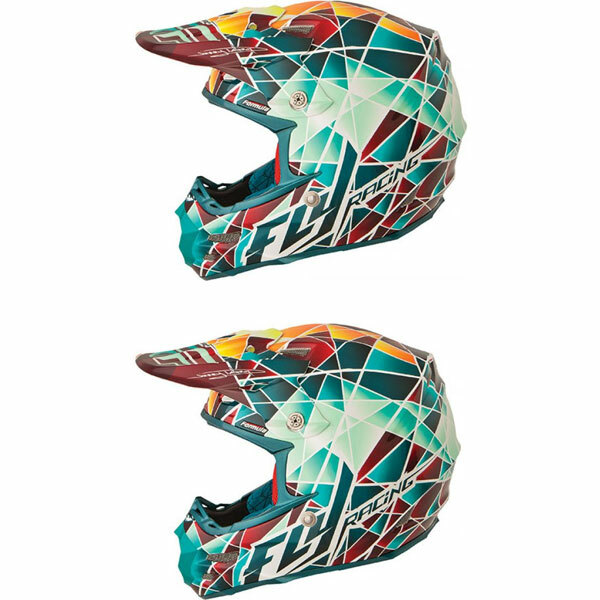 Give your neck a break from the other heavy helmets on the market and pick up one of these vibrant colored Fly Racing – 2015 Formula Facet Helmets before your next ride day.